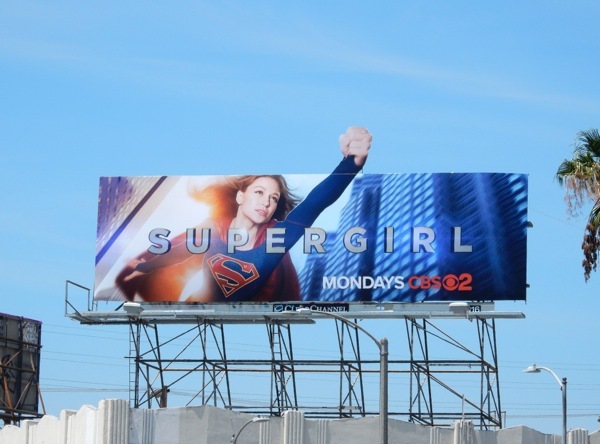 Here's a fantastical billboard to send you soaring into the weekend, the series premiere special extension billboard for Supergirl. 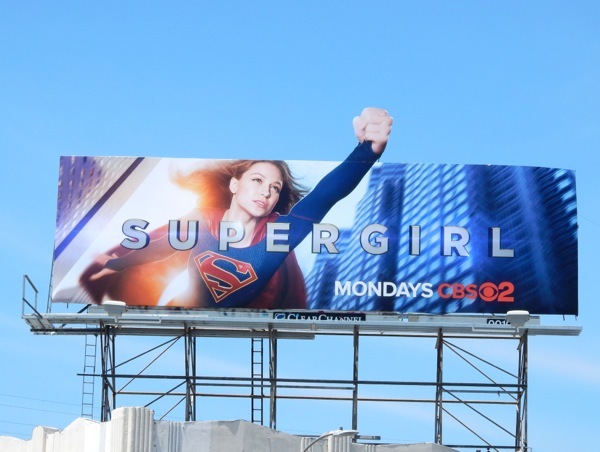 You really can believe a woman can fly with this fun and fresh-faced ad creative, featuring Melissa Benoist as the Man of Steel's cousin. 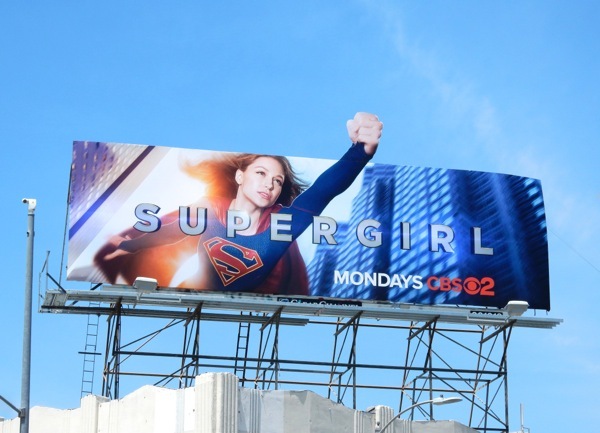 The former Glee star is the titular superheroine and alien 'Kara Zor-El', who was previously played by Helen Slater in the wonderfully camp 1984 movie. 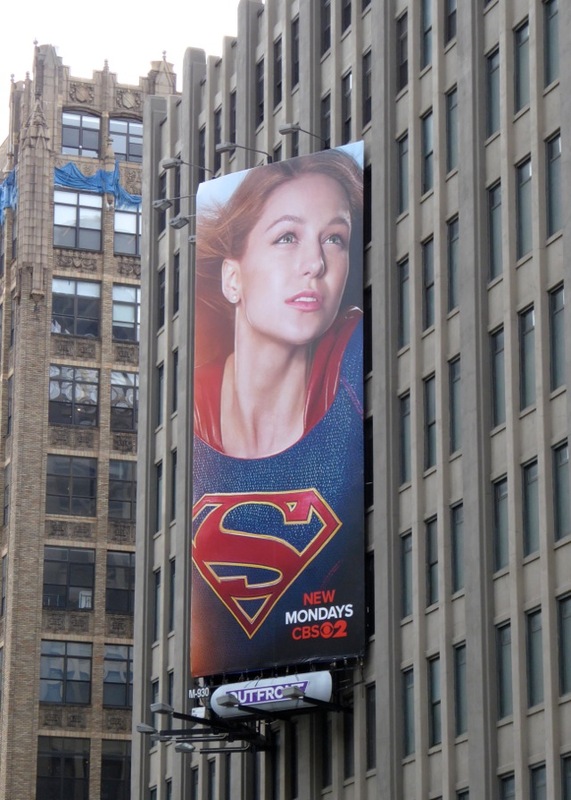 Greg Berlanti, who successfully developed Arrow and The Flash for The CW brings us this new incarnation of the costumed Kryptonian, but as this new series airs on CBS don't necessarily expect any kind of shared DC Comics Universe. 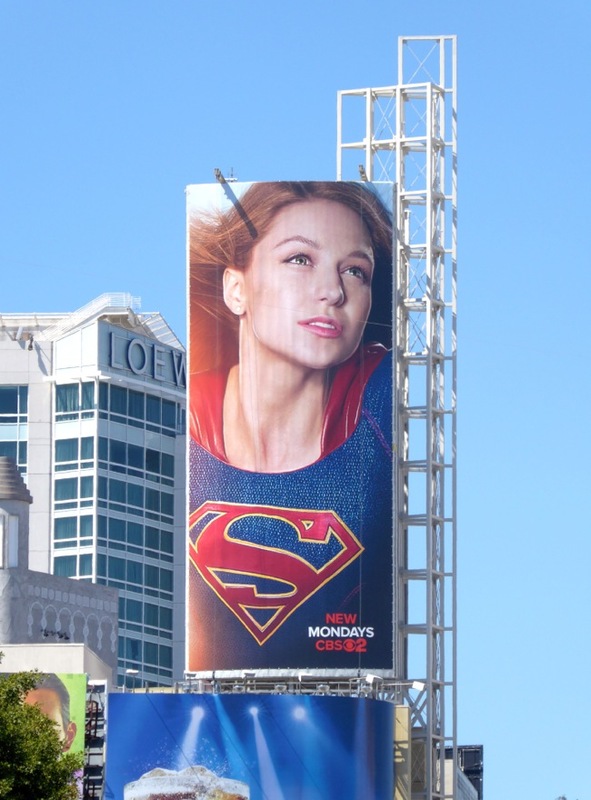 What you can expect is the adventures of a 24-year-old woman who was taken in by the human 'Danvers' family after escaping the destruction of Krypton when she was twelve, and now she's learning to embrace her abilities after hiding them for so long and be the hero she was meant to be on Earth. 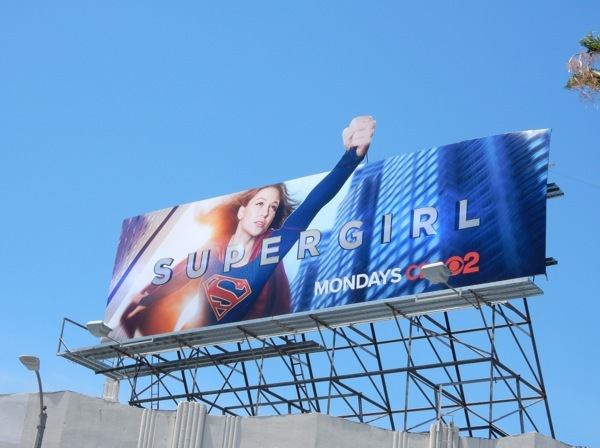 Fans of the 'Superverse' will be pleased to know that Lois & Clark's Dean Cain and Helen Slater herself will play her adoptive parents, whilst Ally McBeal's Callista Flockhart will provide additional star power by playing young Kara's boss, media magnate 'Cat Grant'. 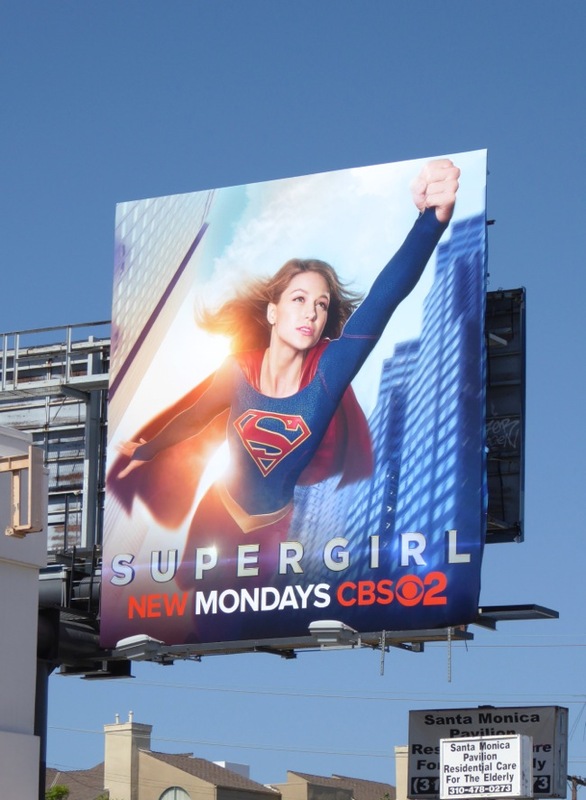 This joyful billboard with its iconic pose is just 'super' and was snapped at the intersection of Fairfax Avenue and Beverly Boulevard, opposite CBS Studios in L.A., on August 4, 2015. 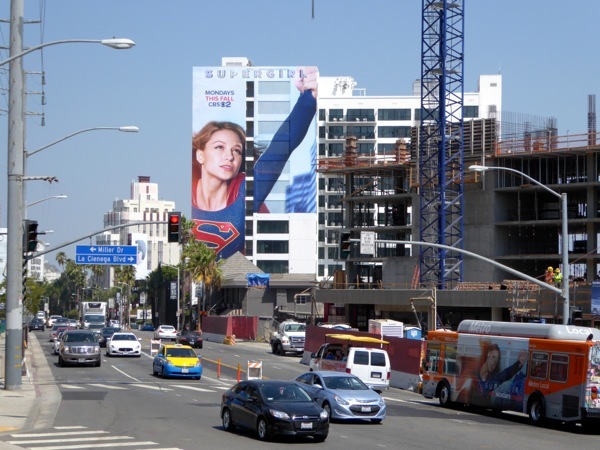 If you're a fan of Superman, be sure to also enjoy these cool Man of Steel movie billboards from 2013. 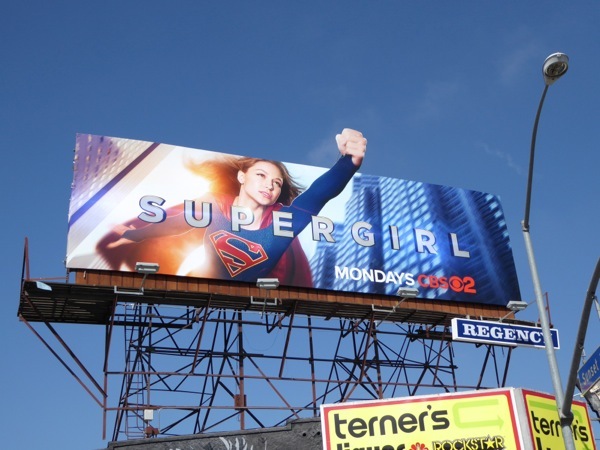 Are you ready for Supergirl to take flight this Fall? 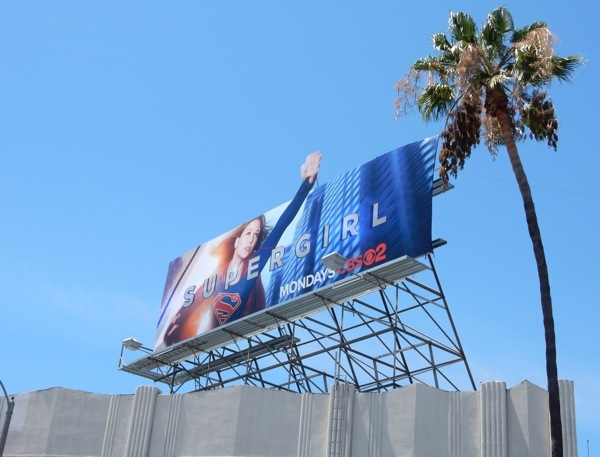 UPDATED: If you loved the special extension for Supergirl's debut, then you'll also love this standard landscape billboard which gets up closer with our heroine. 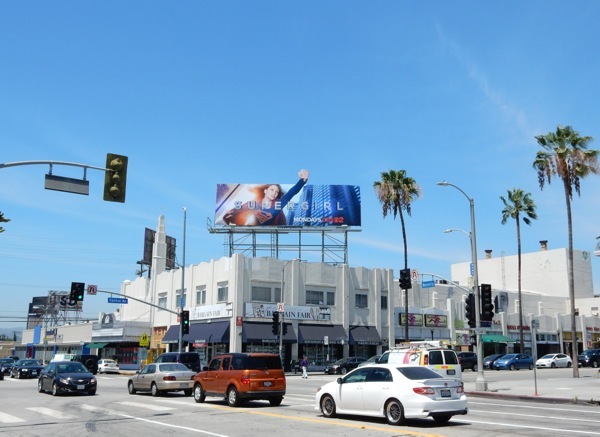 These dynamic creatives seems to have such motion to them and at the moment are easily Daily Billboard's favourites for the forthcoming Fall 2015 season. 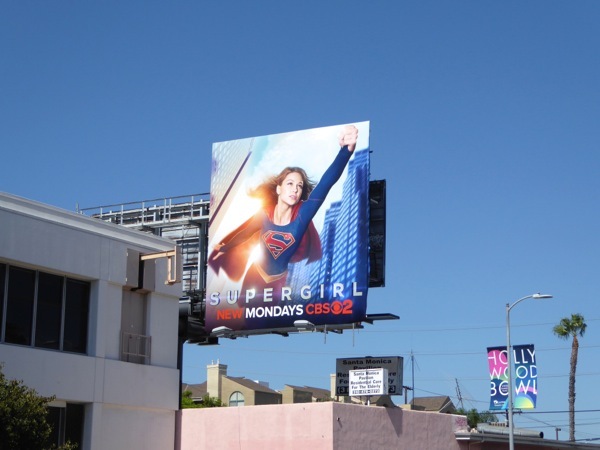 This version was spied along L.A.'s Fairfax Avenue at 6th Street on August 12, 2015. 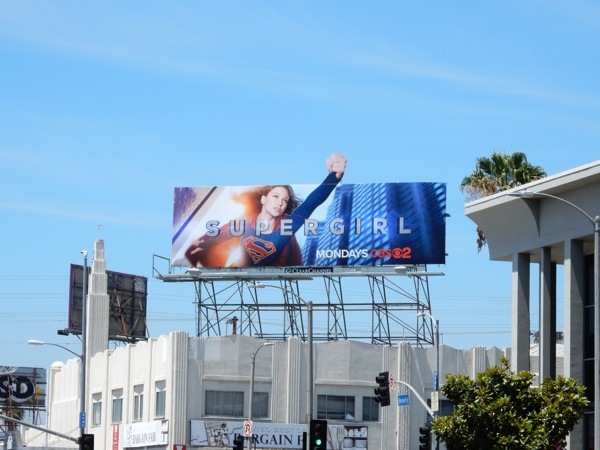 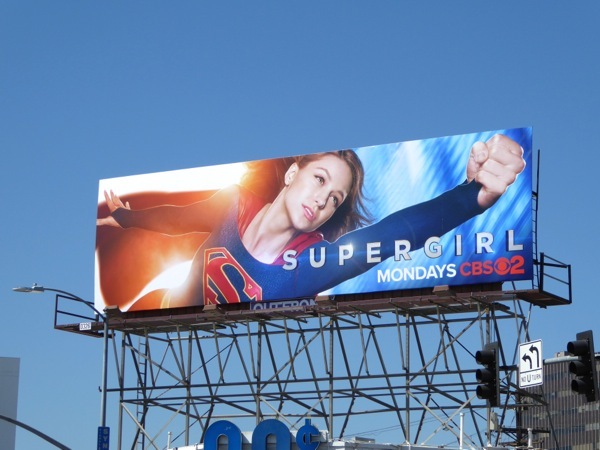 UPDATED: Supergirl is really flying high in the skies of L.A. and we're sure this won't be the last billboard we spy for the caped heroine. 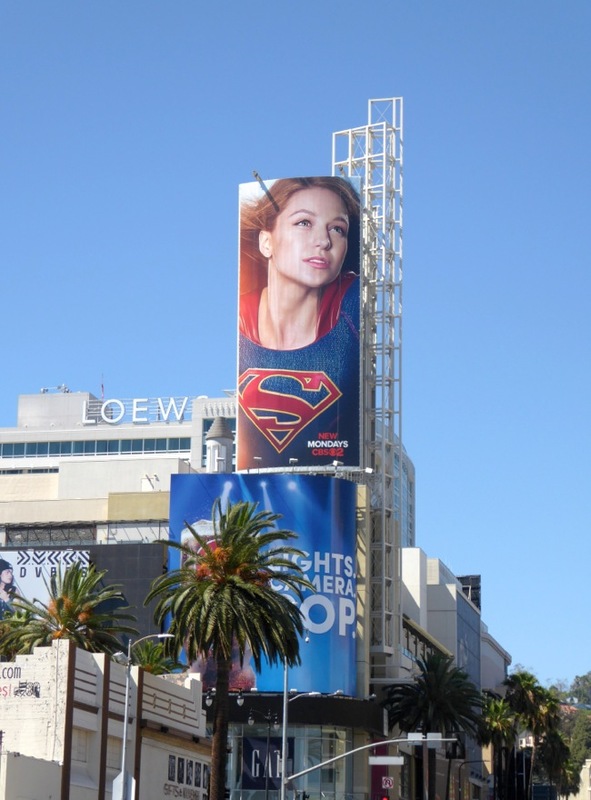 This ad creative prominently featuring the iconic 'S' logo was spotted high above Hollywood & Highland on August 15, 2015. UPDATED: Here's another rather impressive super-sized billboard for the new superhero series photographed along L.A.'s busy Sunset Strip on August 20, 2015. 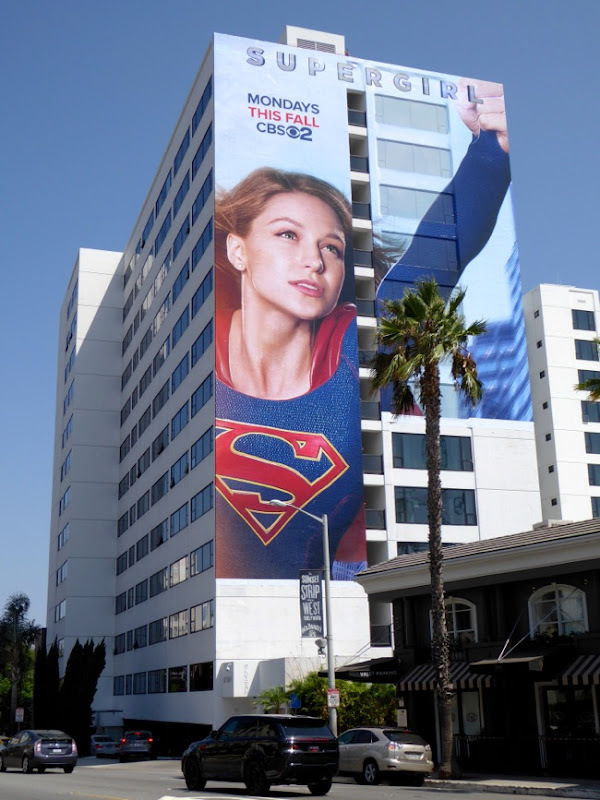 In addition to this giant ad wallscape, if you look closely, you can also see an advertisement for Supergirl on the side of the bus too. 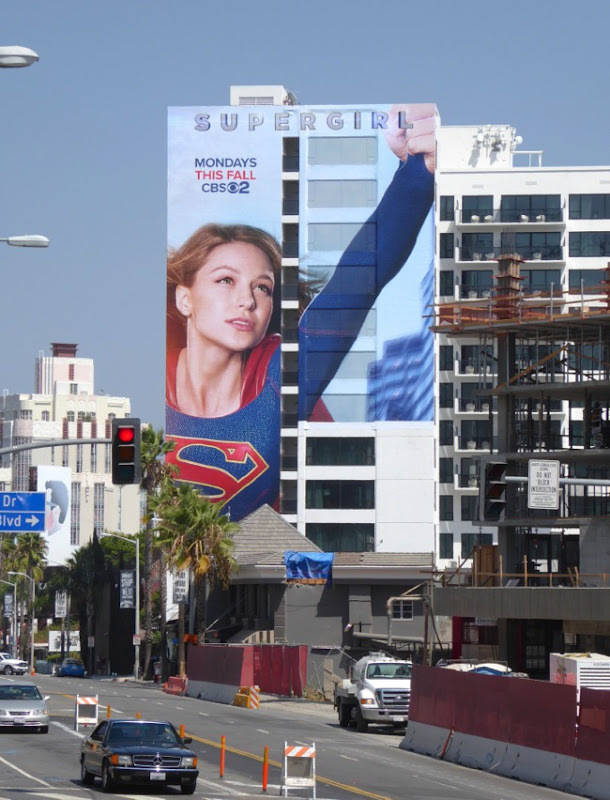 UPDATED: Here's even more support for the super new show, another special extension billboard further west along the Sunset Strip and a smaller ad spotted along Beverly Boulevard on August 23, 2015. 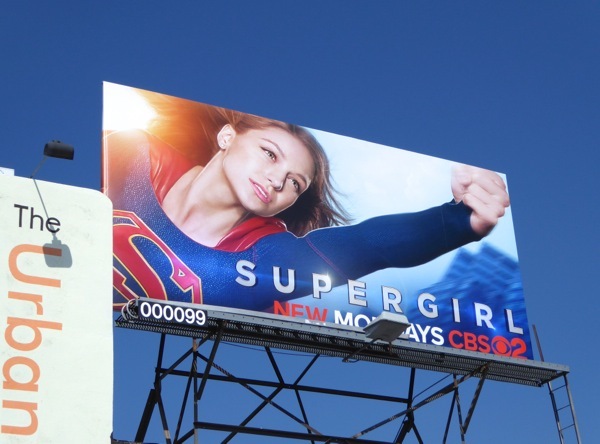 If the series itself is half as good as the launch outdoor ad campaign then CBS should have a hit on their hands. 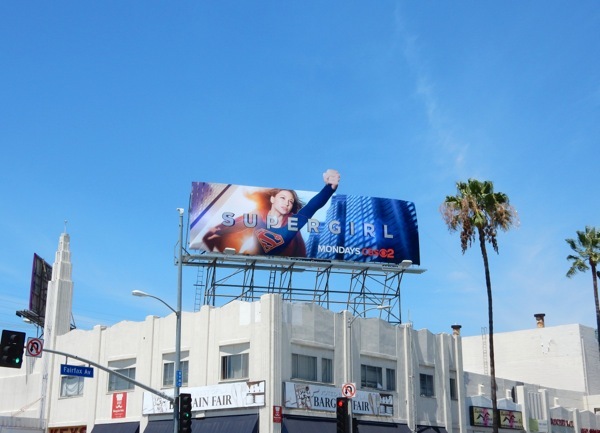 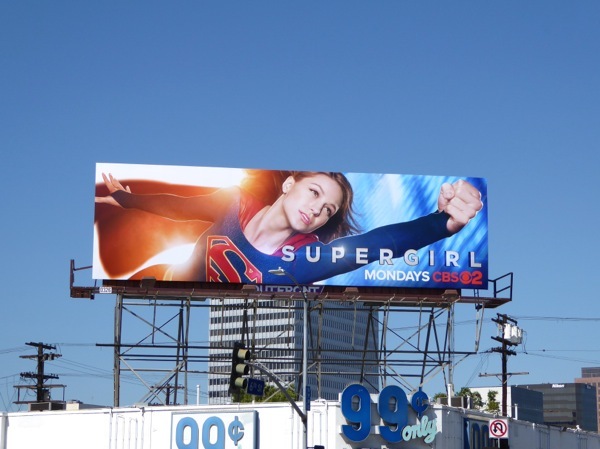 UPDATED: Here's also a squarer format billboard which shows off more of Supergirl's iconic costume and flowing cape, spotted flying over Santa Monica Boulevard in West L.A. on August 30, 2015. 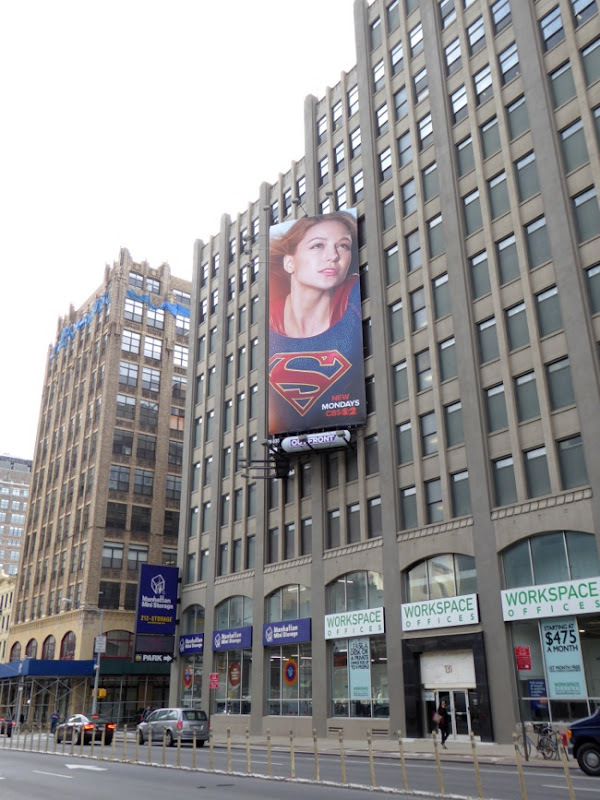 UPDATED: In addition here's the young heroine flying high above Varick Street in New York City on November 2, 2015. 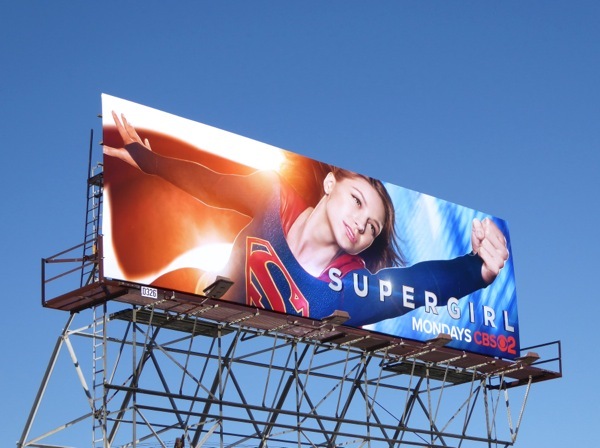 So far her adventures have been a breath of fresh air and a much more hopeful vision of the DC Universe on the small screen, so let's hope she continues to soar.